For more information, contact Caroline Brewer at carolinebrewer@anshome.org or 301-652-9188, ext. 23 or Gregg Trilling at gregg.trilling@anshome.org or 240-426-7150. CHEVY CHASE, MD – The Audubon Naturalist Society has won an innovation award from Bethesda Magazine for the ANS Creek Critters Program which features a free smartphone app where users can easily monitor water quality and protect local streams in the D.C. region. The award will be presented October 18 at the 10th annual Bethesda Green Gala. 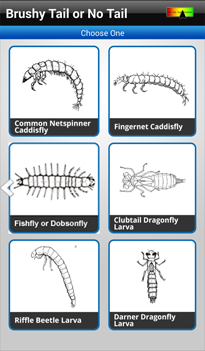 The Creek Critters app allows users to identify small organisms – or critters – in local waterways. What lives at the bottom of streams -- benthic (meaning “bottom-dwelling”) macroinvertebrates – are indicators of water quality because these organisms exhibit a range of sensitivities to pollutants and stressors. Among the many critters are crayfish, snails, aquatic worms, and a large variety of insect larvae. App users generate Stream Health Reports based on their findings, and the reports are displayed on an interactive map. ANS and its partners have used Creek Critters to engage nearly 7,500 people at more than 200 events and activities. Adding those who have used the app independently of ANS, more than 10,000 people have been introduced to water quality monitoring through the app– with users posting data from all over the Washington, D.C. metro region, the United States, and abroad. On September 29, ANS Creek Critter Program Manager Gregg Trilling will lead a field class for the Anacostia Watershed Society’s “Watershed Stewards Academy” students. Trilling and his band of trained interns, staff, and volunteers regularly fan out across the region to work with groups, visit schools, and present at conferences and festivals to maximize the number of people who hop into their local streams to check on water quality. “I am still impressed with how this simple app along with a few nets and buckets has grown a community of clean water enthusiasts. Most people come to our events thinking only fish live in the creek. We can hear the oohs and ahhs when they find their first macro-invertebrate and by the time they leave, they are asking about the health of the stream and what they can do,” said award nominator Sarah Morse, Executive Director of the Little Falls Watershed Alliance. An inspiration behind Creek Critters is ANS’s Water Quality Monitoring Program, one of the largest and longest-running citizen science programs in the country. Since the early 1990s, the program has operated throughout Montgomery County, Maryland, and in parts of the District of Columbia. The program is unique in that volunteers are trained to identify the organisms in the field and then release them alive, rather than preserving them in alcohol and sending them to a lab for identification. The Creek Critters app launched in 2015. It’s available for free download in the Apple App Store and Google Play Store.